Sunset at the Palms, an all-inclusive, adults-only resort in Negril, Jamaica, proudly announces the appointment of the newest addition to its grounds crew, Betty the Goat. Betty, who received her formal training on a farm on the western end of Jamaica, brought with her solid experience in chomping on greenery. Her supervisor, Basil Grant of the landscaping crew, reports that Betty tackles the tasks of managing grass and leaves with gusto and quickly became the highlight of the resort’s weekly nature tour. 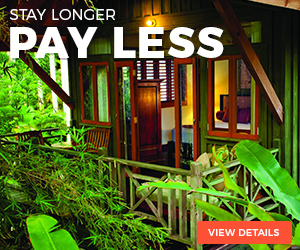 Sunset at the Palms is known for its beautiful and natural setting, a mix of lush jungle and pristine beach that provides the perfect backdrop to 85 treehouse-style rooms on a 20-acre property. Guests can learn about local flora and fauna on weekly guided tours of the resort; though they might encounter woodpeckers, hummingbirds, butterflies, lizards and even a mongoose on these walks, no creature they meet is better received than the eight-month-0ld goat. 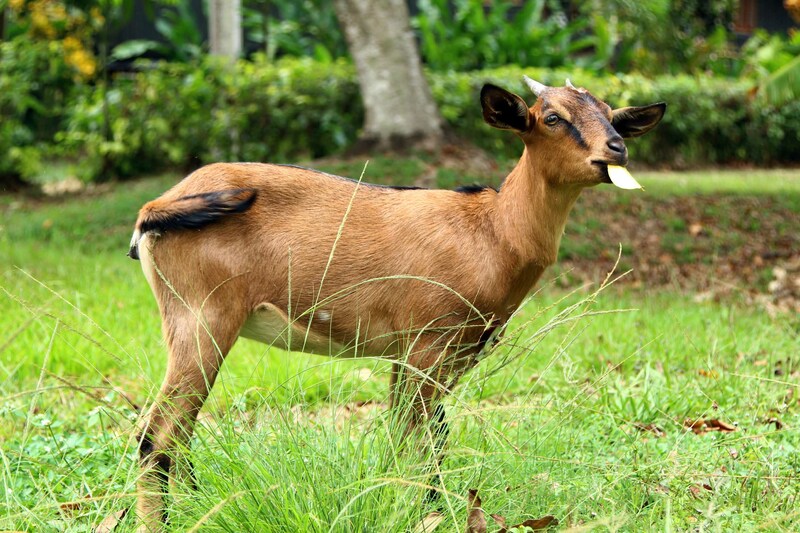 Betty is a cross between Jamaica’s local goat species and a British breed called the Anglo-Nubian – or simply “Nubian goat” in many places, including the United States. The breed originated about 100 years ago, when the Brits cross-bred their own goats with a population of goats that had been imported from India, the Middle East and North Africa. Nubian goats are noted for their large, floppy ears, which is how they can easily be distinguished from other breeds. The species thrives in hot climates, and the Jamaican government is working on a special breeding program as a way to improve the genetic pool for goats across the island. Because Betty is a mix of the two goat species, her ears don’t have the distinctive “flop” of a purely Nubian goat …but they sure do perk up when they hear guests and coworkers approaching. Betty was introduced to the resort as part of an exchange through which the hotel shares its food waste with local pig farmers. It’s through arrangements such as this that Sunset at the Palms could attain its Green Globe certification, which requires its members to uphold the highest standards of sustainability. The certification also recognizes tourism-related businesses that help preserve and celebrate the unique culture of an area, and Betty plays a role in that, as well. 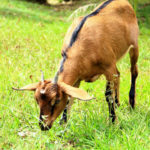 Goats roam freely in Jamaica and are an intrinsic part of the island’s culture. Visitors will likely see countless herds on their way from Sangster International Airport in Montego Bay to Sunset at the Palms, but it’s not likely they’ll meet any goat friendlier than Betty. At a resort whose staff is regularly celebrated for its commitment to guest service, Betty is a favorite who gets a steady stream of compliments on guest comment cards – and accolades from her coworkers. She behaves more like a dog than a goat, demonstrating a pleasant temperament and eagerly bonding with staff and guests alike. Despite her unbeatable work ethic, Betty also thoroughly enjoys her down time. Her hobbies include munching on dried corn to supplement her main diet of grass, bleating at passersby so they’ll stop to chat with her, and enjoying endless pats and rubs. In her quest to deliver the very highest level of guest service, Betty was recently the “plus one” to the best man at a wedding held on property. The guest was so pleased to make her acquaintance that arrangements were made for her to accompany him to the beachfront festivities … and as photos and social media posts prove, she had an excellent time. Though Betty is currently single, the resort does plan to introduce a male goat to its groundskeeping crew soon. Sunset at the Palms is noted for its romantic atmosphere and is a popular site for proposals, weddings, honeymoons and vow renewals, so there’s no telling what may develop. Like so much at this resort, nature may simply take its course.